To commemorate the 2013 centennial of its premiere, Stephen Malinowski and Jay Bacal collaborated on a graphical score of Igor Stravinsky's landmark composition The Rite of Spring. Jay Bacal performed the music using virtual instrument software by VSL. Stephen Malinowski created the animation using his Music Animation Machine (MAM) software. Huffington Post "Brings the piece to life"
Oregon Music News "Simply mind-blowing"
Minnesota Public Radio (Classical Notes) "A magnificent way to see the order in what sounds like chaos"
Anastasia Tsioulcas, NPR: Deceptive Cadence "A mind-blowing visualization"
Judith Mackrell, The Guardian (UK) "An almost celestial clarity ... more about transcendence than terror"
Edward Tufte, Twitter "My favorite #dataviz of 2013"
J. Bryan Lowder, Slate.com "Gorgeous graphical representations"
AJ Vicens, Mother Jones "Prepare to be mesmerized ..."
Greg Sandow, Arts Journal "Truly amazing ... the piece comes to life before your eyes ... score reading for people who don't read scores, though in many ways it's better ... reading the score gives you musical information; Malinowski gives the impact of the music ... sheer magic"
Stephen Smoliar, Examiner (San Francisco) "It has the capacity to bring the listener closer to the inner workings of Stravinsky's approach ... providing the listener with a better-informed ear"
Clive Paget, Limelight Magazine "A genuinely illuminating musical visualisation ... a fantastic educational device for young people"
John Terauds, Musical Toronto "A great viewing as well as listening experience"
John Bailey, The American Society of Cinematogrphers "A hypnotic insight to the score ... caveat: clicking on this video may pull you inside the music and keep you there to the end"
Bruce Reader, The Classical Reviewer "[Of] a number of interesting celebrations, none [is] more entertaining than a new animation by Stephen Malinowski"
James Waygood, Grumpy Gay Critic "Malinowski's theory of eyes leading ears is bang on the money"
Janos Gereben, San Francisco Classical Voice "Not your old color organ"
Trevor Harris, KBIA Radio "A whole new Rite of Spring ... a visual buffet"
Ann Drinan, Polyphonic.org "It's hard to describe in words but fascinating to watch ... just go look at it!" Robert Everett-Green, The Globe and Mail "Visualizes the insistent, unresolving strata"
Colin Marshall, Open Culture "Imagine how it would have blown those early-twentieth-century Parisian minds to see this at the debut"
Janet Palmer Mullaney, The Daily Glean "Astonishing ... a stunning achievement that truly brings a new dimension to the piece"
Rikky Rooksby, rikkyrooksby.com "A terrific educative tool ... this visual presentation could be followed by anyone ... whether or not you know the Rite you should take a look"
Heidi Upton, MERLOT (Multimedia Educational Resource for Learning and Online Teaching) "The colorful and geometric details of animation are catalysts for more granular understanding of musical material"
Ned Gulley, Rambles at Starchamber "This animation by Stephen Malinowski can give you a heightened sense of the wild and rich tapestry Stravinsky assembled"
Diego Fischerman, Fischerman's Tales "Permite, a quienes no leen una partitura, tener, literalmente, una visión de la obra"
Monica Riese, The Austin Chronicle "Emphasizes [the beauty of the piece] and, in turn, becomes something beautiful all its own"
Wayne, Wayne and Wax (blog) "Quite an amazing piece of work ... I love tracking music this way"
Larry F, Telecaster Guitar Forum "I wouldn't say that it is particularly artistic, nor of any research value. But it still is interesting, and helps me shift my focus from part to part really well"
Ricardo Sosa, Facultades mentales "La visualizacion de la obra realizada por Stephan Malinowski es excelente, logrando que se puedan apreciar todos los instrumentos, alturas, intensidades, melodias y armonia." Anonymous blogger, Tangle's Blog "An incredible visual interpretation ... you'll never hear it the same again after you see this"
Joe Barron, Liberated Dissonance "Beats the hell out of Fantasia"
Marina Galperina, I am Turbo "Now, you can see it"
Nicholas, Installing (Social) Order "A pretty fascinating case of infrastructural development"
Dana Huyge, Dana Huyge's blog "Too cool to pass up"
Gerry (blogger), That's How the Light Gets In "Best of all"
James L. Smith, Classical Tyro "Among the best I have seen ... riveting and thrilling ... music should be seen as well as heard"
Geege Schuman, Pandawhale "Gorgeous graphical representation"
Brian Anderson and Ben Richmond, Motherboard "New and stunning"
Ralph Bonheim, Firedoglake "Astounding animation"
Gord Sellar, gordsellar.com "Nothing short of amazing"
Anonymous blogger, No Tritones for You "I mean wow"
Michael Johnson, Facts & Arts "Extraordinary"
@MusicMagazine, BBC Music Magazine "Inspirational"
Anonymous blog comment, circuitfry "I sat through the entire 15 minutes and didn't move ... 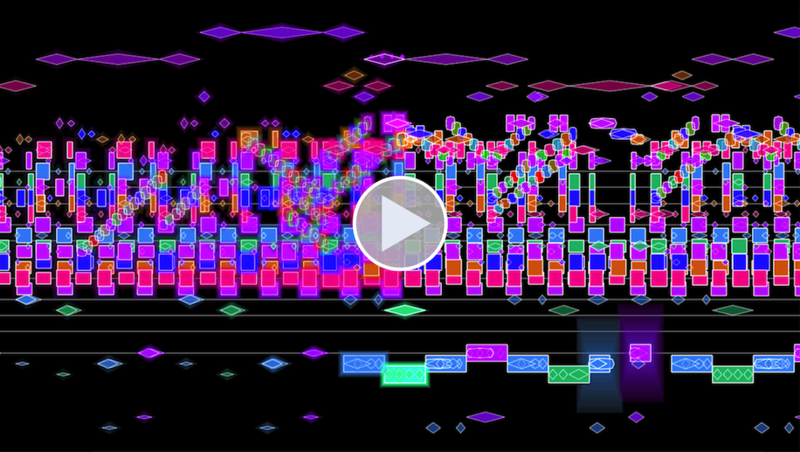 I don't think I've ever done that with music before"
Lisa Turetsky, Stephen's ex-wife "This is the first of your videos that held my interest all the way through"
The animation of Stravinsky's The Rite of Spring can be synchronized with a live performance. The Rite of Spring was performed on November 23, 2013 at the Morelia Festival in Michoacan, Mexico (excerpt showing live synchronization). If your orchestra would like to present music with synchronized animation, please contact Etienne Abelin.